Very nice bracelet however I lost it twice and fortunately found but happened because it fell off due to the hook type clasp. So I had to spend another $20.00 to put a more secure clasp on it! Bali's Komang Suastra evokes a sinnet braid with this beautiful bracelet. 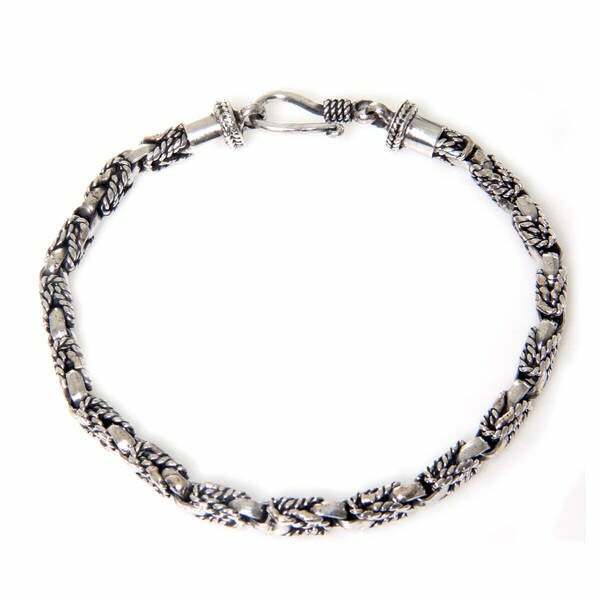 Juxtaposing rich sterling silver textures, he handcrafts a classic braided bracelet. Beautiful piece of craftmanship with Silver, but this is my first time purchasing off Overstocks site. Usually I do Jewelry in person. Did this with a blind eye so to speak. Hard to return, when its from the other side of the world?? Said this was a "MENS" bracelet? Not quite sure what mans wrist the artist used when measuring? I have normal wrists, and this is like 2" too small. This Bracelet is for a child. I can;t even get it half way around my wrist. So disappointed, since I waited close to two weeks for it. Won;t return it, will just keep it and give it to someone little? What a waste. No one to blame but me I suppose, but when I saw "MENS" bracelet, I assumed?? Every time I wear this beautiful bracelet, people comment on how beautiful it is. I like to stack a couple of bracelets at times and this piece stacks nicely. It loo great simply worn alone. This is a winner! Got my bracelet today and it is lovely. So much talent in these artisans, this Bracelet is beautifully made. I wearing it as I'm writing this and can't get over the workmanship in it . I highly recommend. Really pretty silver bracelet. I like the S clasp a lot....makes it possible to me to put it on without having to 'phone a friend' ~ LOL Will enjoy wearing this one a lot! Well made bracelet. Love it. Solid, heavy piece and well worth the price. Secure clasp. Definitely noticeable on the wrist. I purchased it for me but my son liked it so much I gave it to him. Excellent ! Very detailed, weighty, looks lux!! Came back and bought another for gift. I thought this bracelet would stack nicely with other bracelets or worn just by itself.